Sabbat Box is a great subscription box that comes out around the Sabbats. There are eight a year and each one is filled with amazing items specifically for each Sabbat. I’ve officially been getting this box for a year now. 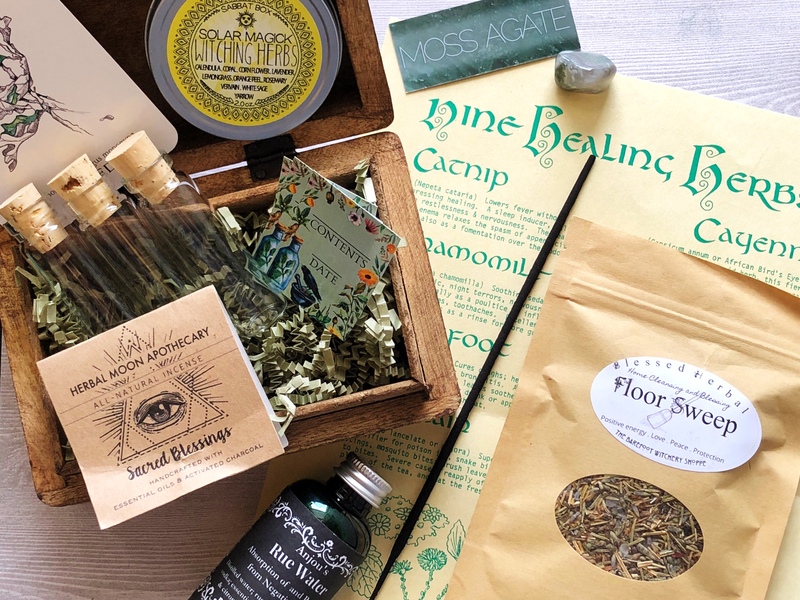 Last year’s Midsummer box was Herbal Witchery and it’s really what hooked me on the subscription. I was so excited to learn that the Midsummer 2018 box would be going back to that same theme with Herbal Witchery 2. Yet again I was blow away with everything inside. Interested in getting your own Sabbat Box? Visit their website and sign up for the waiting list! Many of the products included in each box can be purchased from their store so you can put together your own package of magickal workings. This floor sweep was created by The Barefoot Witchery Shoppe. This is not something I’ve used before but am eager to put to use in my home. There is some negative energy that I am working on banishing and this sounds like it will be a great tool. It can also be used to draw positive energy in. I always love seeing items crafted by Sabbat Box. These witching herbs are like summer in a tin. I personally plan on using them as incense. As someone that is learning more and more about crystals and crystal healing, the set that comes with each box has been a true joy. Moss Agate is the Gardner’s Stone and according to the info card is good for balance, stability, growth and a number of other earth energy qualities. These handmade incense sticks were made by one of my favorite shops, Herbal Moon Apothecary. Rosemary, lavender, and sage gives them a beautiful and still earthy scent that isn’t over powering. This box is full of items that I’ve never worked with before. This rue water was made by Light of Anjou specifically for this box and contains black tourmaline chips. As someone that’s been experiencing some strange things in my home lately I will be utilizing the rue water in cleansing rituals. Each box also came with a single oracle card reading from the Hedgewitch Botanical Oracle Deck by Siolo Thompson. I have personally never worked with an oracle deck so getting this card has made me interested in checking this deck out and learning more. This particular card is beautiful. I don’t even know where to begin with this. It’s so much more than I ever thought I would receive in a subscription box. This little herb kit comes with a beautifully carved wooden chest. It has a floral vine design. Inside are three glass vials for storing herbs and contents labels to attach to them. Also included was a pocket guide for herb gathering that I found extremely useful. Overall I think this may be my favorite box to date, although I feel like that with every new delivery. I can’t wait to see what’s in store for the next one! Make sure to check out our other Sabbat Box unboxings and reviews for more!